There are 10 stalls for rent in our newly remodeled stall barn. Each matted 12 x 14 stall has a private run and mud free porch. We offer full care and clean stalls daily, feed our home grown grass hay, provide mineral block, quality Purina concentrates, quarterly de-worming, and turn out as weather permits. We also offer an all weather 180 x 80 outdoor riding arean tack room, 50 foot round pen, trailer parking, and open access to over 38 acres of pasture riding. We are located just 8 min from I-5 of the Goshen/Hwy 58 exit and close to many other indoor arenas and horse trail parks. We schedule lessons and clinics on a weekly and monthly basis in the Eugene and Creswell area. 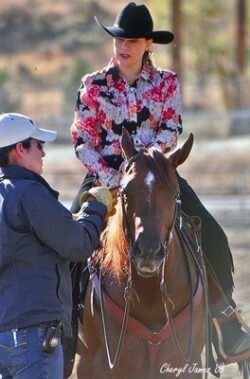 A reining and beginning western horsemanship clinic series is being held at the White Ranch beginning in August 2012 in our NEW OUTDOOR ARENA. I am also available for 4-H, OSET, IHSA, POA, and other youth programs. Our facility is fully insured and I carry liability policy at host facilities as required by most stables. I am flexible on your riding and training goals and design a lessons program or clinic format around riders objects. Rates Vary on Horse use, location, and size of group. A lesson is about 1 1/2 hours including tacking , grooming, riding and cool down. Most lessons involve 45-60 min of in saddle time. *Group lesson at the White Ranch on Student horse is $30/hour ** see clinic rates for groups of 5 or more.